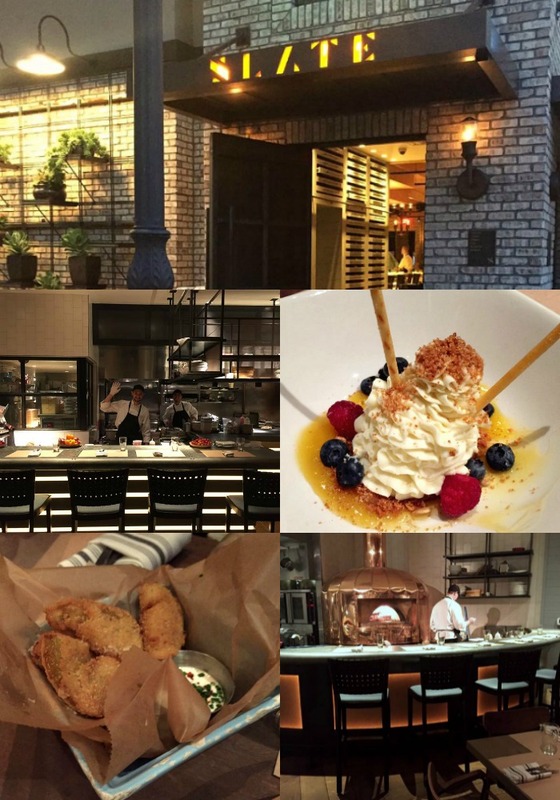 If you find yourself in Orlando, Florida, make sure to plan a trip to SLATE, a classic modern American restaurant nestled in the heart of the Dr. Phillips neighborhood for an extraordinary dining experience you won't soon forget! A few weeks ago, my husband and I flew to Orlando to attend the Food Wine Conference. We planned our arrival a few days ahead of the conference, so that we could enjoy some time with some close blogger friends. It was a dream come true, because we had been waiting for years to finally all come together in person, and of course, there is no better way for food bloggers to enjoy each other's company than to sit and break bread with each other! 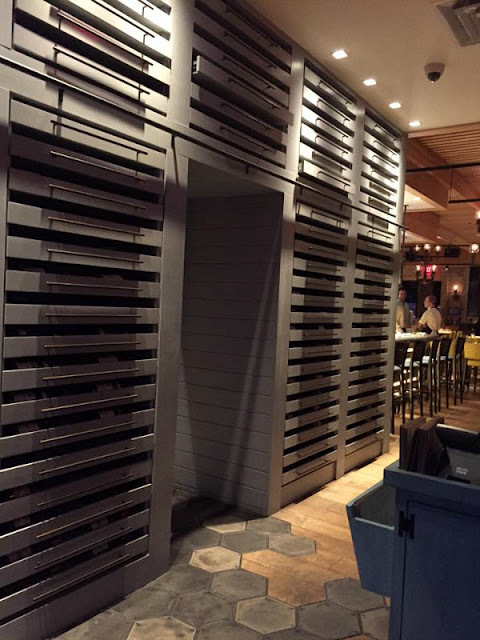 After carefully looking over our dinner options, we decided on SLATE, a classic modern American restaurant in the Dr. Phillips neighborhood of Orlando. At first glance, the menu sounded amazing and we loved the idea of the wood grilled cuisine and the open air dining! Upon arriving at SLATE, we were pleased to find parking was so easy! With a city as busy as Orlando, parking can often be a challenge. As we walked toward the restaurant, our noses were treated with the most amazing aroma of wood grilled cuisine! The building was sleek, modern and so inviting with southern hospitality (gas lights on each side of the door , y'all...see my southern is coming out already! ), I honestly could not wait to get inside. Once I passed through the entrance, to my left, was an excellent collection of wines placed in drawers on the wall. While I did not enjoy a glass of wine that evening, two members of our party did. They were pleased with the selection. 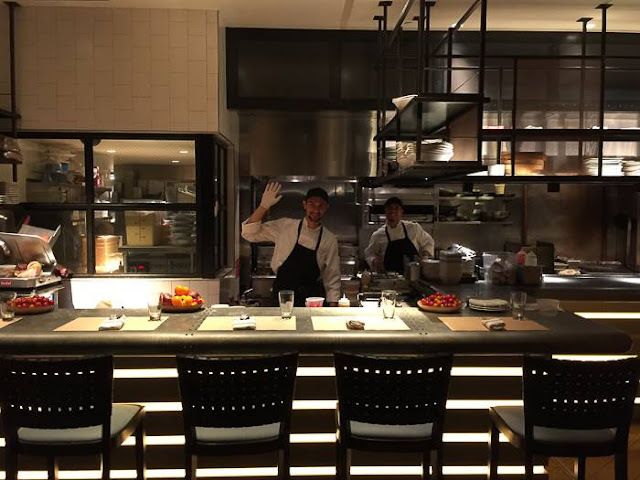 I really enjoyed the open kitchen with adjacent bar that allows you to watch staff create their magic. I mean, what food blogger wouldn't? The kitchen staff and our server, were all very friendly, accommodating and knowledgeable and ready to answer any questions we had. SLATE has your standard bar area, but I loved that they also have a little casual nook with a wood burning fire place where you can sit and enjoy a casual cocktail or glass of wine or two with friends. 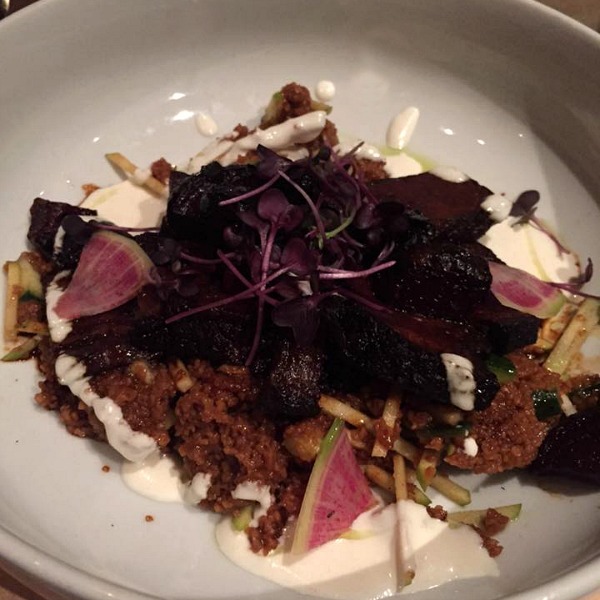 Since SLATE is a farm-to-table restaurant, you will find the items they offer on their menu varies from day to day. 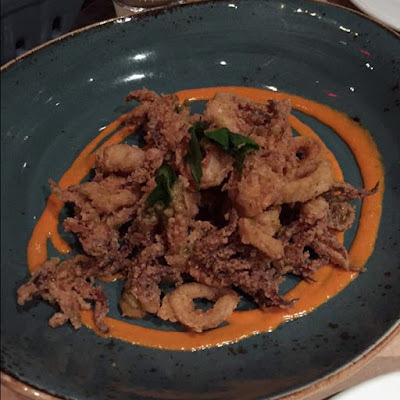 They use only the freshest ingredients in their dishes. It is American inspired cuisine with a Southern flare. We started our dinner off with cocktails. I ordered this delicious signature cocktail, The Thyme Traveler. 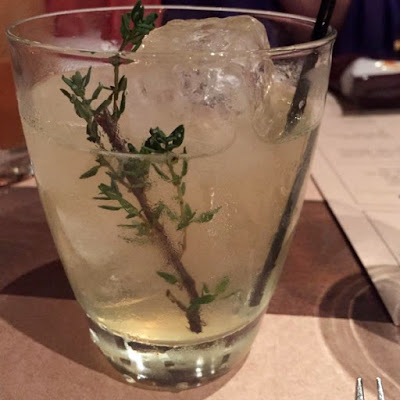 It's a mixture of thyme infused St. George Citrus Ca. Vodka, Giffard Lich-Li, Lemon, Matcha Green Tea, and plum bitters. It was refreshing and not too sweet, which I enjoyed. Our next course was appetizers. We ordered several for the table to share. I am such an appetizer fan, I could have ordered everything on the "Start" menu and been completely happy with nothing else! haha We all agreed on some amazing fare though, and in the end, I was glad I held back and saved room for an entree and dessert! 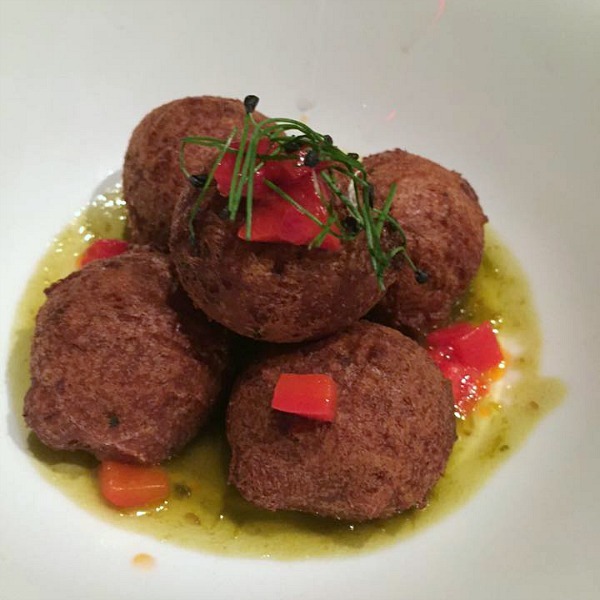 Some of the appetizer highlights included these Pimento Cheese Hush Puppies with Jalapeno Jelly. Two southern staples woven into a delicious nosh! Make sure you try these...they are delicious! The Sweet and Sour Calamari was among one of my favorite dishes of the night. It was so tender it melt in your mouth and had just the right amount of crunch. Also tops on my list of appetizers were the Fried Green Tomatoes with Buttermilk Dressing. Quintessential southern cuisine at it's best and SLATE really nails it on this one. 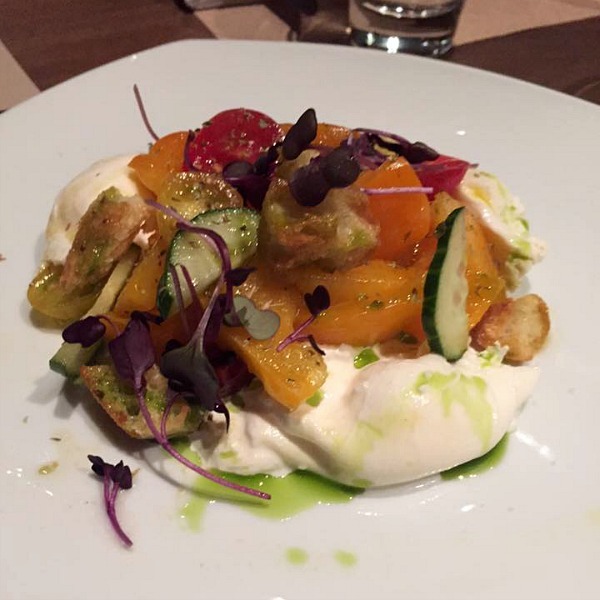 For the cheese lovers, it was this amazing Burrata. OMG...if you have never enjoyed fresh burrata cheese, you must try it and SLATE is the place to do that! This soft and creamy fresh mozzarella-like cheese is topped with waterkist farms tomatoes, cucumber, olive oil, croutons and Greek oregano for a wonderful beginning to any meal. I'm glad we saved room for the entrees, because both items my husband and I enjoyed were spectacular! 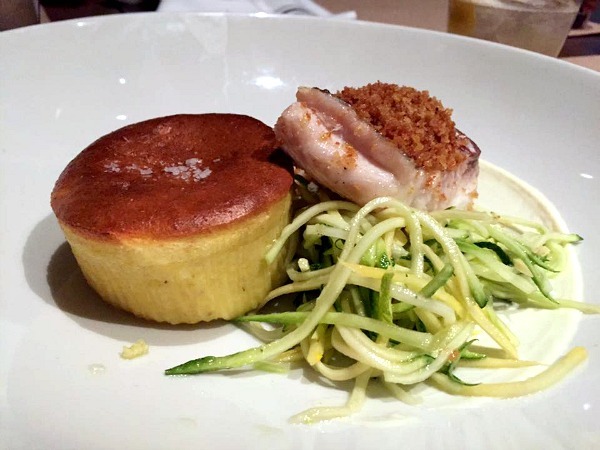 Joe ordered the Hearth Roasted Red Snapper with lemongrass, cornmeal spoonbread, zucchini noodles and rosemary breadcrumbs. He proclaimed it as one of the best meals he has ever eaten! The snapper was cooked to perfection. I managed to grab a bite of his cornmeal spoonbread. It was light and fluffy, almost souffle like, and it was absolutely delicious! I decided to order SLATE'S famous Smoked Brisket. Our server told us all about how painstakingly SLATE's chef prepares it in a two-step process which begins with a slow cook overnight. The brisket was flavorful and melted in my mouth. SLATE also offers this same brisket on their brunch menu served with eggs and home fries! What's a meal without a little sweet finish? 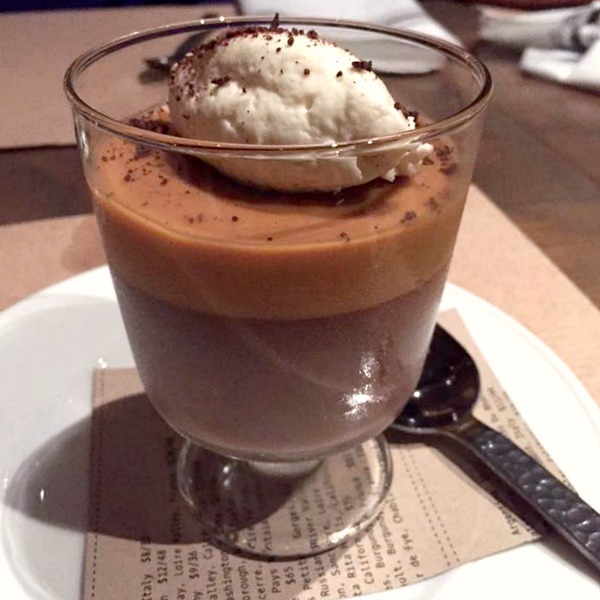 I was ALMOST too full for dessert...but I knew I could find room for some chocolate in the form of this light and creamy Salted Caramel and Chocolate Pot de Creme. Let me just say, it was every bit as good as it sounds. Bites of pure joy! 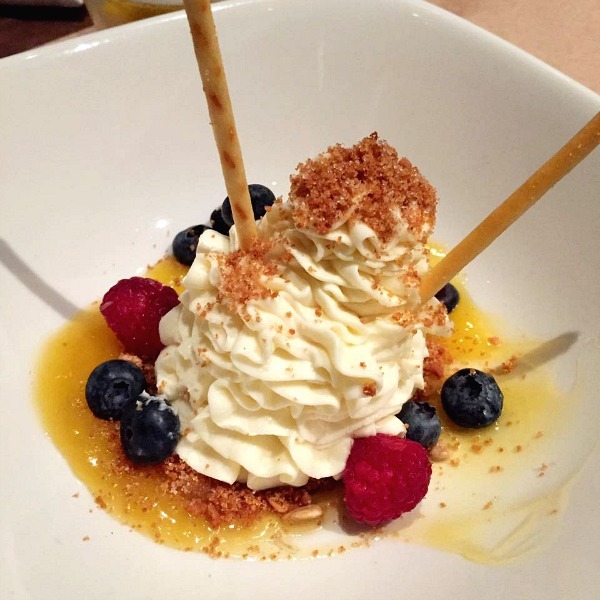 Joe opted for the Passion Fruit Cheesecake Mousse. My husband is not a big dessert person. In fact, most times, he passes on dessert, but when this dish arrived in front of him, he dug right in. I never even had a chance to take a bite, before he polished off the whole thing. I kid you not, this non-dessert husband of mine ate every last bit this mousse. 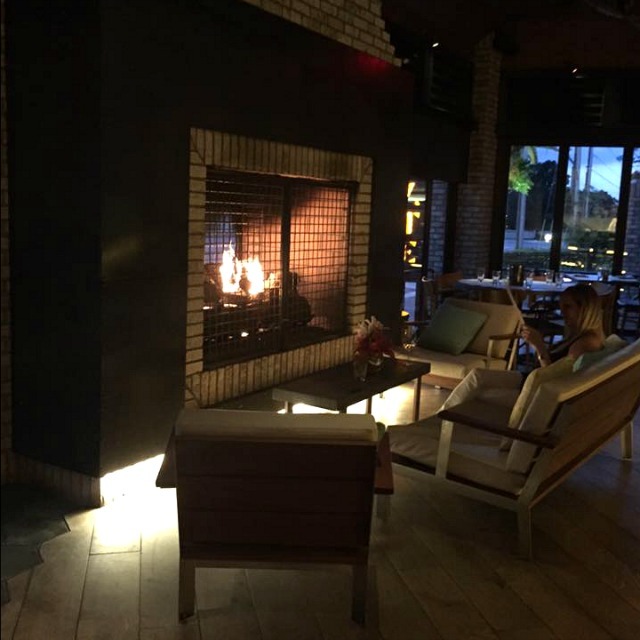 Everyone agreed that SLATE Orlando made our night with friends memorable! Thank you Slate Orlando and Visit Orlando for an exceptional meal and night! I know I will be putting it on my itinerary my next visit to Orlando! To find out more about SLATE Orlando, check out their website or follow them on social media! Don't forget to contact VisitOrlando before you plan your next trip to Orlando, Florida for the best visitor and travel information! They are the official source for Orlando travel planning! Disclaimer: We were given a complimentary meal at SLATE courtesy of VisitOrlando to facilitate this review. All opinions in this review are 100% mine alone. Many thanks to Cory from VisitOrlando for this amazing dining experience! Hi Renee, it was so great to meet you and Joe and everyone else. 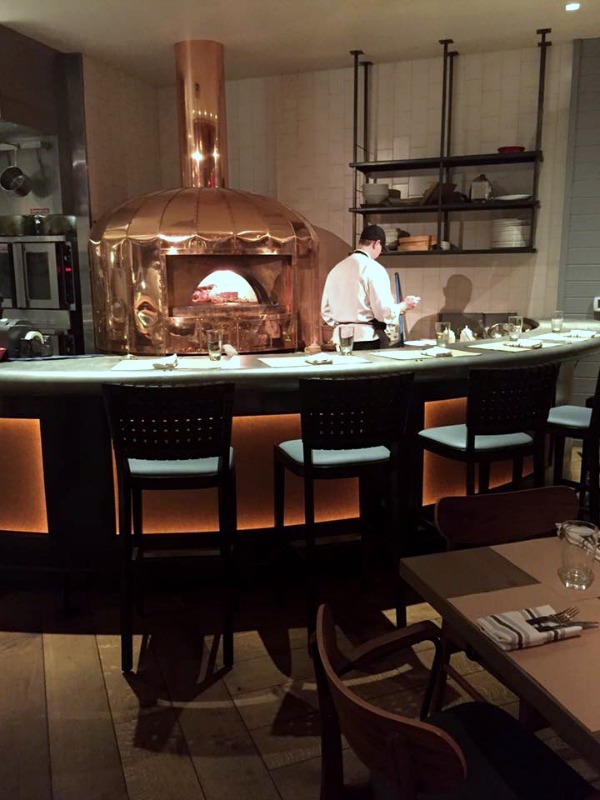 I loved the atmosphere and the food at Slate. It was a perfect place for our group dinner!! It really was the perfect night! This was such an awesome experience! Was great getting to meet Joe finally! Everything was delicious and I can't wait to go back! I've got it on my radar next trip to Orlando! It was great meeting all of you as well! Looks like a wonderful place to dine. I don't get to Orlando often, but if I do, I'll remember it. 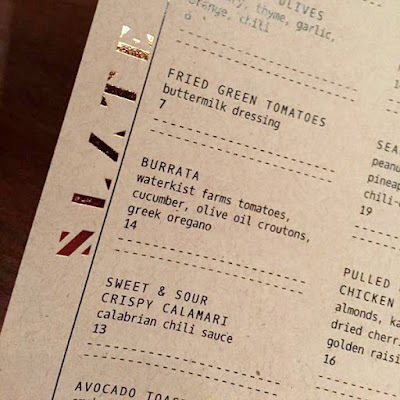 It's always fun to discover a new restaurant with great food and service. Oh my goodness! Those fried green tomatoes and that cheesecake mousse. I will remember to try this restaurant next time I'm in Florida! Definitely put it on your bucket list! 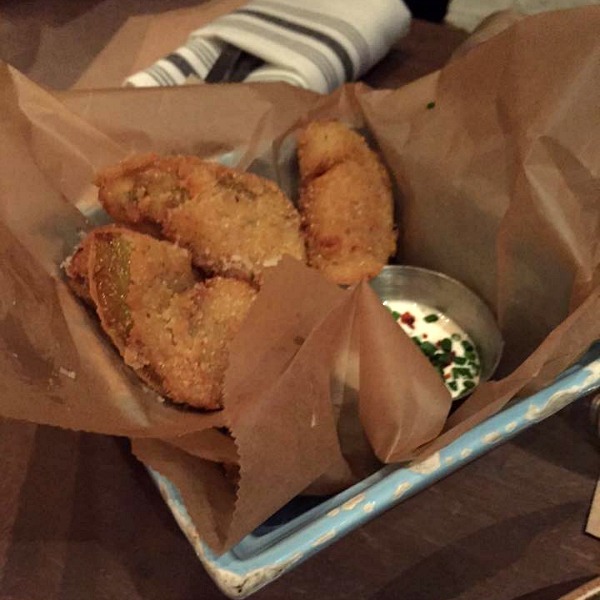 Worth it for the fried green tomatoes alone!